I hate the wind. Typically said when it's cold and/or gusting 20+ mph. OMG where is the wind??? Usually uttered on a hot, muggy run. Oh man that wind feels fantastic. Shouted with glee during the summer. I hate rain. Usually grumbled during the winter, torrential downpour, or when it's gusting winds. I love running in the rain. Either said during the summer or right after a rainy run when you're giddy and don't know what you're thinking and saying. I hate running in the freezing cold. Said angrily during the cold, dark winter mornings when you're dressed in multiple layers of everything and sleet is pelting your eyeballs. Ugh, it's never ever going to warm up. Muttered in the early spring when we're just happy to wear a single layer of clothing. Man I wish it would cool off again. Said during the summer when we've forgotten what 14 degrees feels like and we're melting because it's 90 degrees at 5 am. I hate getting up early to run. Uttered when the alarm jolts you awake at 5 am. I love running in the morning. Said dreamily when you see a sunrise or when you're done and you know you're DONE for the day. I love running after work. Said usually when the temperatures are ideal after work (warmer, but not too warm). I hate running after work. Grumbled when you are worn out from the day and it's now too hot to run. I love running at lunch. Said when the weather is absolutely perfect and you need to get outside. I don't like to run at lunch. Usually said when your stomach is about to eat itself or the weather went south. I love my foam roller. Said after you're done using it and your muscles are happy. I hate that torture device. Said with a whimper when you're just starting to roll out a knot. Ugh, I hate traffic, why are all these cars out. Said with an annoyed humph when you had to stop yet again, totally disrupting your flow. Love traffic, so happy it's busy today. Thought secretly when you're struggling during a run and the only way you'll allow yourself to stop is when traffic forces you to do so at intersections. 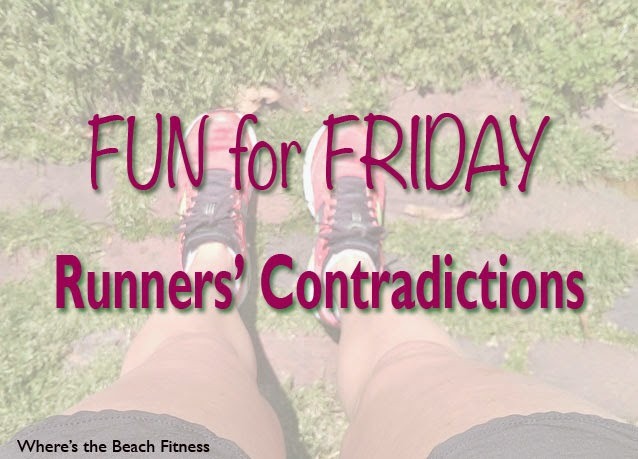 What are some of your running or workout contradictions? I think I've said every single one of those. It's what we do! Love this! So awesome. We definitely all do this.